Because most foods eaten today are processed, digestive systems have a harder time breaking down fats, carbohydrates and proteins. Digestive enzymes break down food nutrients into smaller sizes that the body can use more completely and efficiently. 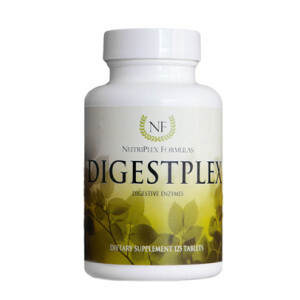 Digestive enzymes are also used to combat indigestion and its side effects, like bloating, heartburn and flatulence. Supports proper digestion, cholesterol health, and more! Beet Root (100mg),* Pancreatin 4x (75mg), Ox Bile Extract (65mg): Proprietary Blend: Betaine HCl, Lipase, Papain, Amylase, Pepsin, Citrus Pectin Cellulose, Glutamic Acid, Protease andMalt Diastase. Inactive Ingredients: Microcrystalline Cellulose, Arrowroot,* Hydroxypropyl Cellulose, Croscarmellose Sodium and Silicon Dioxide. In addition to the unique properties, synergists and cofactors of this food, each serving provides the following nutrients contained within the above food-nutrient blend (not as isolates): Iron, Folate, Manganese, Copper, Potassium, Phosphorus, Vitamin B6, Vitamin C, Bile, Hydrochloric Acid, and Lipase, Amylase and Protease Enzymes. 1 tablet per meal, or as directed by a healthcare practitioner. Digestive supplements may be recommended in cases where the body’s enzymes are inadequate and organs are not functioning properly, or the diet is overwhelming the body’s ability to break down food. Digestive enzymes may be used to break down fats, proteins and carbohydrates — to make them available to the cells. Common concerns related to poor digestion include indigestion, bloating, heartburn, flatulence, difficulty digesting fats, gallbladder and liver problems, high cholesterol, fatty liver, discolored stools and failure to utilize both essential fatty acids and fat-soluble vitamins A, D and E.